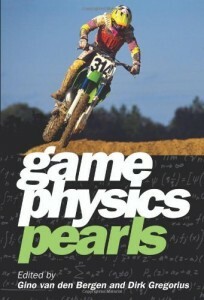 Game Physics Pearls has been a book on my wishlist for a while, and I’ve finally got the chance to finish reading it and putting up this review. The text is edited by Gino van den Bergen and Dirk Gregorius, and each chapter is written by a unique author. I found that a lot of ground was covered while still keeping the book somewhat cohesive. It doesn’t feel like a complete random mash-up, and the progression is nice. Some of the chapter content includes: basic mathematics, game physics pitfalls, broad phase, narrow phase, GJK, SPH, parallel particle simulation, ropes, soft bodies, and verlet integration. Even after reading several game physics books, there was still a decent amount of information I had not seen before. I especially appreciated the chapter on verlet integration (and the subsequent chapter on cloth physics that builds upon it). So many of the books I’ve seen seem to focus on Euler integration techniques and it’s rare to see much talk of verlet integration (or position based dynamics for that matter). This is the direction I am going with my physics engine, so it was nice to see some coverage. Overall I was impressed with the quality of the book. Sometimes with these “gem” style books, it can be a hit or miss if the chapter is relevant to your needs. I did not think that was the case here. Nearly all the chapters had some pertinent information, and (while maybe not directly relevant to my current project) were at least interesting to read. I did not feel bogged down with math, most of the explanations made sense and there wasn’t too much needless minutia. I would definitely recommend this title to anyone interested in video game physics. While there are other books that may be better places to start (as the book sort of assumes you know the basics already) this would not be a bad book to add to the collection. There are actually only a couple game physics books that I *haven’t* read, so it’s getting to the point I will need to stop researching and start writing code. Wish me luck!